Our in-depth knowledge and industrial expertise enable us to manufacture a distinguished range of Solar Steam Generator. - Used by various communities for cooking food and many other purposes. We bring forth our vast industrial experience and expertise in this business and are instrumental in offering wide assortment of Steam Generator. This Steam generator Is Specially Designed for the Small Panch Karma Departments or For Personal Use at Home and For Health Clubs. Having Two Safety Valves for Personal Safety. We have been counted amongst the most trusted names in this domain, engaged in providing Steam Generator. 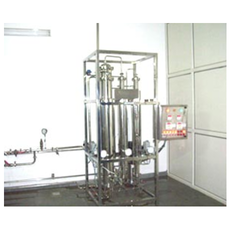 Our company manufactures high quality Electrical Steam Generator with Cooking Vessel to our esteemed clients. These generators have high pressure reciprocating pumps which have the ability to withstand different temperatures. Cylindrical copper vessel 180x115 mm (height x dia. ), with filling tube, steam vent and vertical tube terminating the chute passing through side of vessel. Brass tube, a sliding fit in the central tube, to carry thermometer. Lower end cut at an angle to seal the chute.